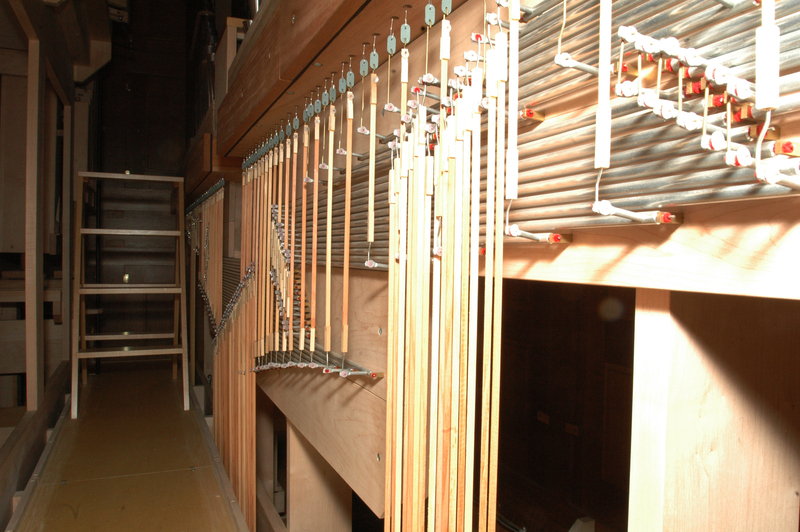 In November of 2008, Opus #151 by the Noack Organ Company, was installed. Voicing of the pipework was done during January of 2009, and a liturgy for blessing the organ held on Saturday, February 21, 2009. Designed by Fritz Noack in collaboration with our music director, the instrument was built by the craftsmen of the Noack Company at their shop in Georgetown, MA. 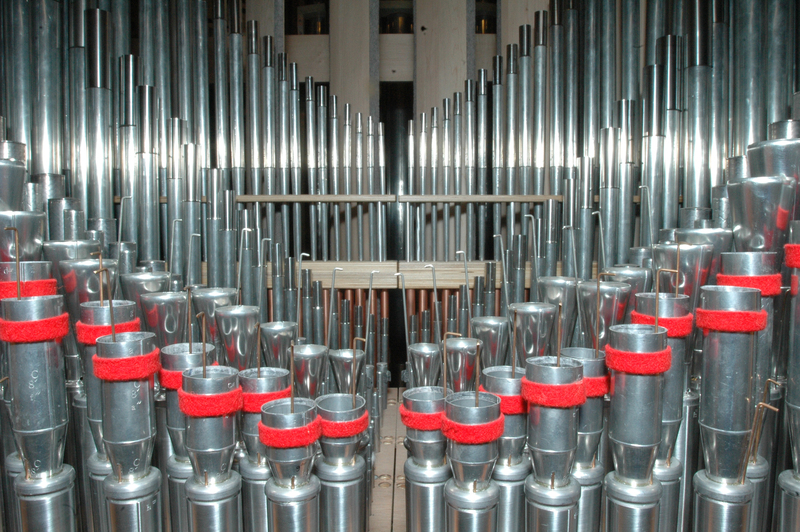 After the entire organ was put together, it was dismantled for shipment by moving van, and re-assembled at the church. While the instrument includes use of contemporary materials, the basic philosophy of this organ has roots in earlier centuries, such as the windchests and mechanical action it uses. Each manual and pedal key has a purely mechanical linkage with the pallet (valve) that admits air to the pipes. The windchests and key action create a more musical and reliable instrument than other types of construction. For instance, the player has some control over how fast the pallets (valves) open and close, allowing for more nuance in how the pipes speak. The winding system allows some flexibility to the "breath" of the organ, and the tuning system (temperament) gives a different "color" to the various key signatures. Organs were built in this fashion for centuries until the advent of electricity made mechanical action "obsolete." The return to using mechanical action began in the 1920's when people such as Albert Schweitzer became interested in the organs played by Bach and his contemporaries. This "Organ Reform Movement" slowly gained momentum in Europe as the predominant way of organ building before taking hold in North America. Tonally, our instrument finds its heritage in historic European organs, and the best builders of early 19th Century America. In addition to the construction by the Noack Organ Company, console and other technical enhancements have been provided by Rosales Organ Builders, Los Angeles. Also, changes to the Swell reed stops and other tonal enhancements have been provided by Gober Organs, Inc., Ontario, Canada. Detached console, Mechanical key action, Electric stop action. Great to Pedal, Swell to Pedal, Swell to Great All Pistons General Cymbal Bells Straight/concaved pedalboard.